What can you control using Home Automation Technology? 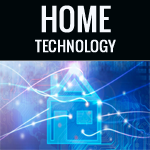 You are here: Home / Featured Articles / What can you control using Home Automation Technology? Your home is said to be automated when all or most of the devices and appliances in your home are connected together in a network and these can be controlled via a interface or platform that is accessible over the Internet. So, basically, you can control your home appliances from your office or while travelling using your smart-phone or any other mobile device once you are connected to the Internet. Home Lighting – You can control the lighting in your home. or on and off at irregular times to deter any potiential Burglars when your not at home. CCTV System– You can monitor your home CCTV system even when you are away from home. This advancement in technology is helping to improve home security.In addition to this, you can also have automation devices that can alert you remotely of movement in a certain room or area to help you monitor and secure your possessions. With Home automation you can also lock and unlock doors in your home or set pre-programmed alerts to notify you should a certain Door be opened in your absence. You can also control Home entertainment systems like Blu ray players, DVD players, screens, audio systems, etc, using home automation, you can also access files such as music files from your home system via remote access using home automation. Home heating to come on at times that best fits your individual living patterns. EG: Setting your water heating system via remote to have hot water on hand from when you return home from work. This will ensure that your home is always warm when you need it, but at the same time, when you are not home, energy is not wasted. Thus, home automation systems, not only provide comfort, but also help with Entertainment Management, Energy Management Access control and Security.